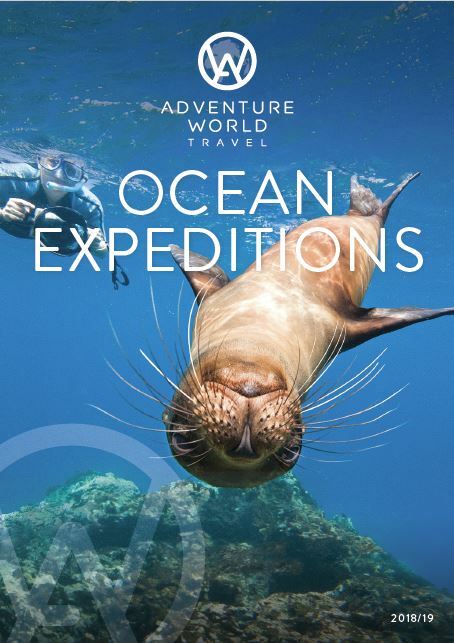 Adventure World Travel's first dedicated Ocean Expeditions brochure. Experts in tailor-made holidays, Adventure World Travel, has launched its first dedicated Ocean Expeditions 2018-19 brochure. The brochure features Adventure World's handpicked selection of the best ocean expeditions from magnificent tall ship experiences with Star Clippers, to magical wildlife encounters with Lindblad Expeditions-National Geographic venturing through Alaska, the Arctic, Antarctica, Galapagos and Patagonia. The expeditions invite visitors to experience first-hand some of the most remote and beautiful pockets of the world with the added bonus of five-star comfort, exquisite cuisine, plus the chance to enjoy up-close-and-personal wildlife experiences which larger ships simply can't deliver. Neil Rodgers, Adventure World Travel Managing Director commented: "It was only a matter of time before we released a brochure dedicated to our ocean expeditions collection. We know travel agents love presenting their clients with the opportunity to explore some of the world's most extraordinary destinations and pristine coastlines from our fleet of expeditions ships, and our first-ever Ocean Expeditions brochure does exactly that." For more information visit Adventure World Travel at adventureworld.com or call 1300 363 055.